Driving into the courtyard of Chateau Moulin Caresse in Saint Antoine de Breuilh our immediate reaction is to exclaim at the natural charm of the place. In the attached map below, look at the top left quadrant in green to the west of Ste Foy La Grande to get a sense of the location near Vélines. 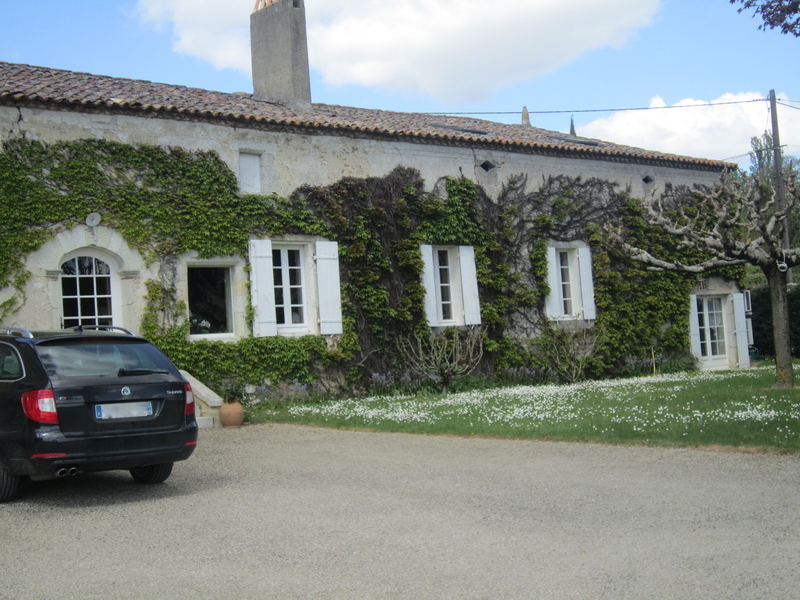 The property is on the right bank of the Dordogne River and is at the eastern end of a large plateau that begins in St. Emilion which is 20 kms away. The gravel driveway where we enter is surrounded by trees and shrubs on one side, the office and tasting room straight ahead and the long, low building of the chateau is on our right hand side, on the south slope with a view over the expanse of the Dordogne Valley. It’s a landscape of trees, river, vineyards and orchards. Mme. Sylvie Duffarge, co-owner with her husband Jean-Francois and responsible for the marketing of the wines, greets us and invites us to the tasting room to talk about their wines. She emphasizes that her husband’s family has been making wine here since 1749 and their sons are now in the business with them. We contemplate the enormity of the changes that successive generations of this wine making family have faced over the centuries. In 1749, Louis XV was on the throne in France, George II in England and the revolutions in America and France were in the future. Musically, it was the time of Handel and Gainsborough was painting his pastoral portraits of English families. All this gives us a sense of historical perspective. Chateau Moulin Caresse is one of many examples of family run businesses in France where successive generations build and evolve the business over time. Mme. 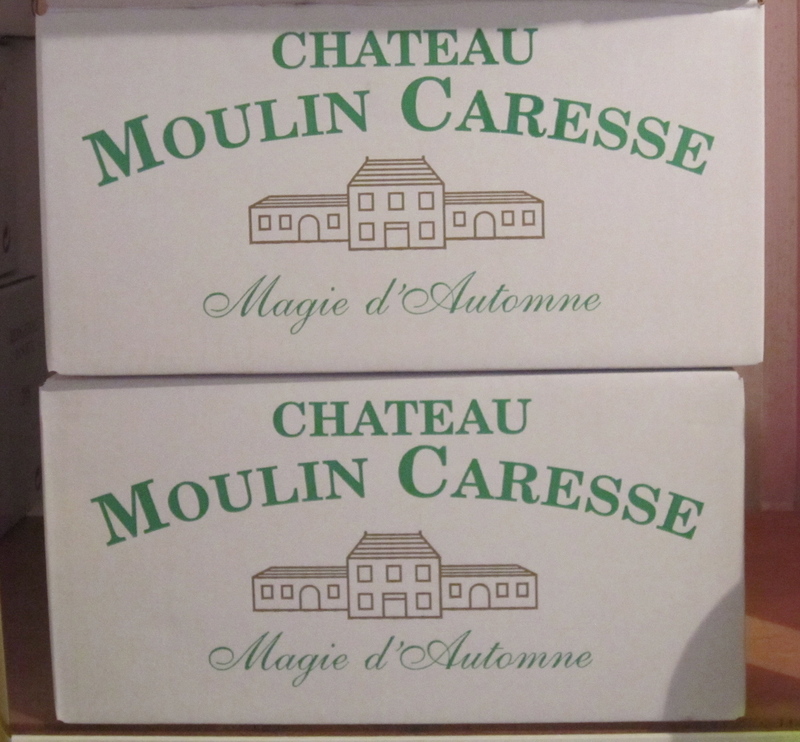 Duffarge expains that Chateau Moulin Caresse makes wine according to the Bergerac and Montravel AOC guidelines. They make 5 levels of wine: Cuvée Cépages – young, everyday wines; Cuvée Magie d’Autonne – wines matured in barrels and can be laid down for 5 – 8 years; Cuvée Cent Pour 100 – superior wines that can be laid down for 7 – 15 years and Cuvée Coeur de Roche – their grand cru de domaine red wines that can be laid down for 15 – 20 years. They also make a sparkling wine: Perles d’Ecume. We tasted most of the wines and focussed more on the Cuvée Cépages and Cuvée Magie d’Autonne. In the Cuvée Cépages range, we particularly enjoyed the rosé which is Cabernet Sauvignon based. This is an excellent vin de plaisir (everyday wine) for the summer. In the Magie d’Autonne range, we very much enjoyed the white. It’s a blend of Sauvignon Blanc, Semillon, Muscadelle and some Sauvignon Gris, a grape not generally used but Mme. Duffarge advises us that it adds texture to the wine. The wine is a brilliant crisp pale yellow colour with substance and texture. The Magie d’Autonne range is made according to the rigorous Montravel AOC guidelines. The Duffarge family have 52 hectares under vines planted mainly on the plateau which has sandy clay soil with pockets rich in iron deposits. The soils here can give a minerality to the white wines characteristic of the Montravel AOC wines. The hillsides or coteaux are clay limestone which is best suited to the Merlot and Cabernet France vines. 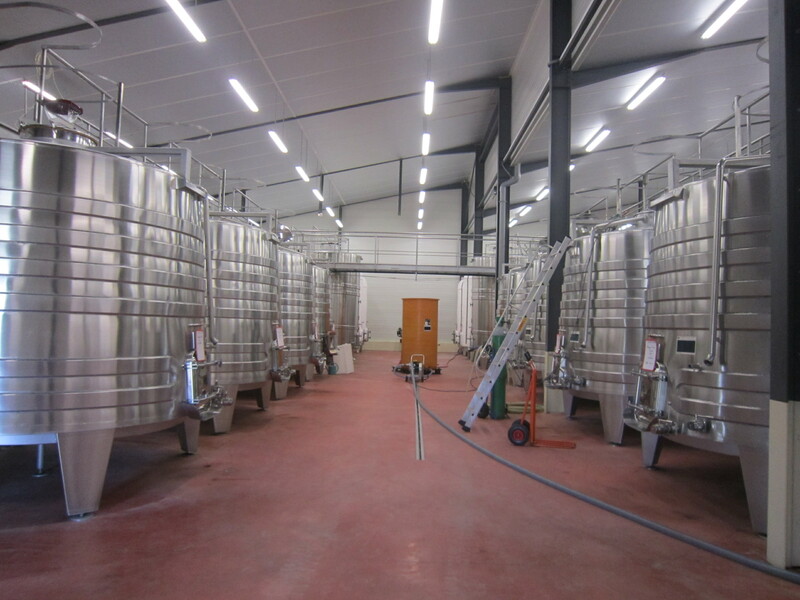 A new chai or winery was built two years ago with mainly stainless steel and some cement vats. The white wine is fermented in oak casks and rolled to stir the lees. When asked about the use of sulphites, a preservative used in wine making since antiquity, Mme Duffarge mentions that they are using significantly less sulphites than several years ago due to better technology and improved wine making practices. This was a common message we heard in our visits to Bergerac wine makers. Chateau Moulin Caresse wines are award winners. The Cuvée Cent Pour 100 Montravel AOC wine has been a consistent winner of awards including Decanter World Wine Awards. The Magie d’Autonne Montravel AOC white wine is a well regarded white wine of the region. For Canadian readers, Chateau Moulin Caresse Magie d’Autonne 2007 red is available through the Quebec Liquor Stores. The visit to Chateau Moulin Caresse was particularly interesting as we had little previous contact or knowledge of this corner of the Bergerac wine region. Meeting Sylvie Duffarge and hearing the family story highlighted for us the ongoing commitment of multi-generational wine making families in this region both to the land and to quality wine making. 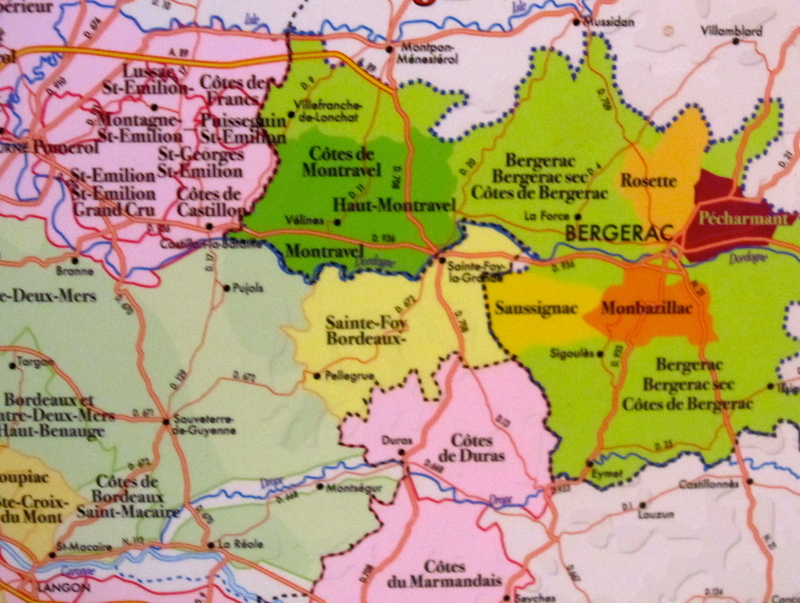 This entry was posted in French Wines, History, wine tasting and tagged Bergerac wine region, Chateau Moulin Caresse, Dordogne, French Wines, SAQ Quebec Liquor Stores, South West France, wine tasting notes by elizabethsvines. Bookmark the permalink.